You won't see Honeywell Inc. on any lists of the highest growth companies in the U.S., but it's generated returns that have doubled those of the market over the past decade. 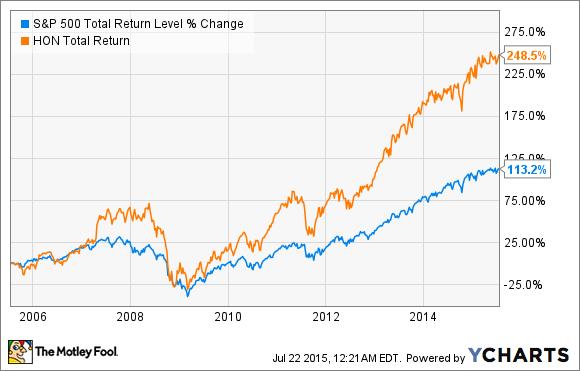 Honeywell (NYSE:HON) may not seem like a high-performance stock, but over the past decade it has actually doubled the performance of the S&P 500, which is amazing for a company that many investors have never heard of. It's done this by generating a steady stream of cash and reinvesting where it can, returning cash to shareholders when that's the best investment. Second-quarter earnings results showed a continued -- albeit slow -- improvement in operations, and even though Honeywell won't knock the socks off any growth companies, it's a great stock for investors looking to beat the market long term. A diverse business like Honeywell won't grow like some of the high-profile stocks on the market, but you can see that over the past decade it has steadily grown revenue while greatly increasing net income. HON Revenue (TTM) data by YCharts. In the second quarter, a similar dynamic could be observed, with core organic sales rising 3%, although reported revenue was down 5% for a total of $9.8 billion. 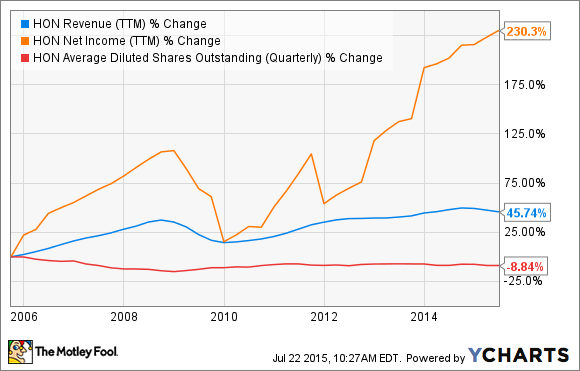 Net income outpaced that by rising 8.6% to $1.19 billion, or $1.51 per share, again a theme we've seen over the past decade. The top line is being dragged down by foreign currency exchanges and the divestiture of Friction Materials last year for $155 million. In total, those factors had a 7% negative impact on revenue. A strong dollar isn't something Honeywell can change, though, and it's something that has hurt American companies with significant international sales. That's why the organic sales number is worth watching -- a 3% organic growth figure isn't bad for a diverse industrials business. Margin expansion efforts, like HOS Gold, have also paid off, and margins expanded from 16.7% a year ago to 18.4% in the second quarter. Margins can only expand so far, but as they do it'll allow net income to rise much faster than sales, as it has for Honeywell for years now. When you combine the expanded margins and continued share buybacks, earnings per share are expected to rise 9%-11% in 2015 to $6.05-$6.15. Long term, this slow and steady organic sales and earnings growth creates a market-crushing stock. A dividend yield of 1.9% shouldn't be overlooked, either. That's nearly what treasuries pay, and with net income growth, those payouts should grow steadily over the long term.